What really influences our buying behavior? What sways our purchasing power from one direction to the other? On one hand is necessity, which deeply impacts when and how we decide on what to buy. If you only have $10 to spare, eating lunch trumps buying a nice shirt, simply because you can just wear an old shirt at home, but you can’t function well on an empty stomach. Then there’s preference, which also has a strong influence on us and our buying psyche. If there are two similar types of running shoes, with similar prices and features, our preference would probably go all the way down to what color we like. Simple as that. So in selecting a taekwondo uniform to buy, we hope to dissect both the necessary and the preferential so you will be properly guided and come out with the right set for you. A complete Taekwondo uniform set has three pieces: the pants, jacket, and belt. While the top (or jacket) and the bottom (or pants) are with you on the onset, the colored belts are earned and are usually given after you’ve completed all the necessary steps to go to the next level belt. Meanwhile, what comes with the original set is a basic white belt. The most important factor to consider in buying your taekwondo uniform is the make and material. Because your uniform is both for function and aesthetic, it could actually fall in both categories. 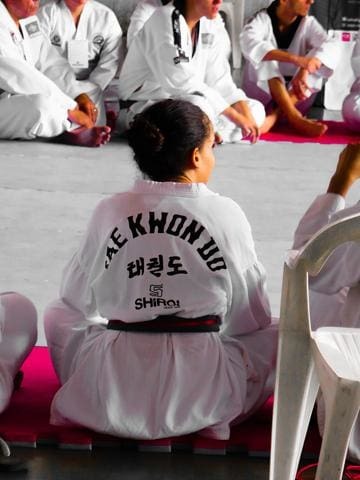 However, I find it more appropriate to consider the uniform’s make as an imperative because it could spell the difference between a great taekwondo workout and an irritatingly, uncomfortable one. Taekwondo uniforms come in a variety of fabrics and weights. You must be keen on choosing the right material thickness and heaviness that would best suit your build and the uniform’s purpose. If you select a heavier fabric, it will feel thicker and weigh more against your skin. However, you will enjoy its durability and you can use them longer than the flimsier ones available in the market. The common downside of heavier material is that they will make you feel hotter and sweat more. Conversely, fabrics with lighter weights are more breathable but might look worn down after using it for a long time. You may choose from lightweight uniforms ( 5 to 6 oz. ), Medium weights (7 to 9 oz), and heavyweight (10 oz and above). Beginners usually select the lightweight ones, while the long-time practitioners and instructors use the heavier-weighted uniforms. This is, however, not a hard-and-fast rule. You may think that the color of your dobok is of your preference. However, this is mostly dependent on what color your school or training facility wears. It’s called a uniform, after all, so you have to wear as they wear. It would seem disrespectful to wear a different colored dobok and not look in unison with the rest of your school or teammates. Be mindful of the stitching and the quality of the uniform. This is definitely a necessity. Low-grade uniforms will just tear after a few uses or even when washed. You wouldn’t want that now, would you? Reinforced stitching is a feature that you should always watch out for. Especially in competition. You can avoid a terribly embarrassing and traumatic uniform-ripping memory by making sure your uniform is doubly-reinforced in all the right places. It may come as a surprise to you that size is a preference in buying your taekwondo uniform. But this is because of the presence of the graded colored belts. Having the belt in your waist cinches your uniform tighter, making it look and feel more put together. So it’s not really a life-and-death situation if you choose a uniform that might be a tad tighter or looser. The length of the arm sleeves may or may not go beyond your elbows. As I said, it is more flexible and can suit your liking. Of course, there’s a different size for kids and adults. However, for teens, they can opt for either the biggest kids size or the smallest adult size. Whatever would be most comfortable for them will do. You can also mix and match your jacket and pants. If you’re a little heavier on top, you can go for a larger jacket and a slimmer pair of pants. It’s highly customizable. As long as you can move freely, that’s all that matters in sizing. Taekwondo is a sport that demands a lot of movement, so it is understandable that most students want a looser fit. There are also parents who buy uniforms that are two sizes bigger so that their kids can use their uniforms longer. Don’t be overwhelmed in choosing the right taekwondo uniform for you. As long as you know which factors and features are essential and which ones are according to your liking, you won’t go wrong with your choice. 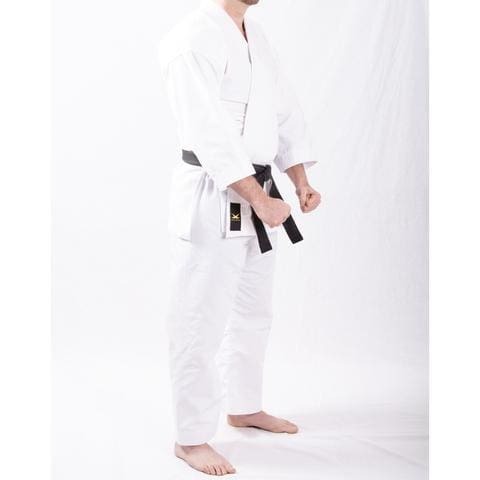 Visit our website to check out our selection of martial arts uniform, gear, apparel, and accessories.